Abstract: Visual Studio 2017 (VS 2017) is the latest version of Visual Studio. This article explains some of the most important features of VS 2017 which are useful for boosting developer productivity. Initially named “Boston”, Visual Studio has gone through a number of transformations in the last two decades. Right from its Visual Basic and Interdev days, Visual Studio has evolved with every release to address new markets and provide improved experiences across multiple platforms and devices. Visual Studio 2017 (VS 2017) is the 11th version of Visual Studio with a focus on improving experiences around mobile apps, cloud services and devops. New IDE features like interactive code suggestions (intellisense), easy code navigation, debugging, fast builds and quick deployment are some of the productivity and performance enhancements in VS 2017. This article explains some of the most important features of VS 2017 which are useful for boosting developer productivity. Visual Studio 2017 can be downloaded from this link. The installation allows you to choose and install just the features which you need; which makes the installation faster. The Workloads tab provides installation options which are grouped to represent common frameworks, languages and platforms. The main advantage of grouping is that a developer can easily choose a feature set to be installed based on their needs e.g. only Windows Features or Web and Cloud features etc. The advantage of the new setup experience is that, now one can choose only those features which are needed for his/her development. Individual components can be used by advanced developers to further customize these features of Visual Studio. 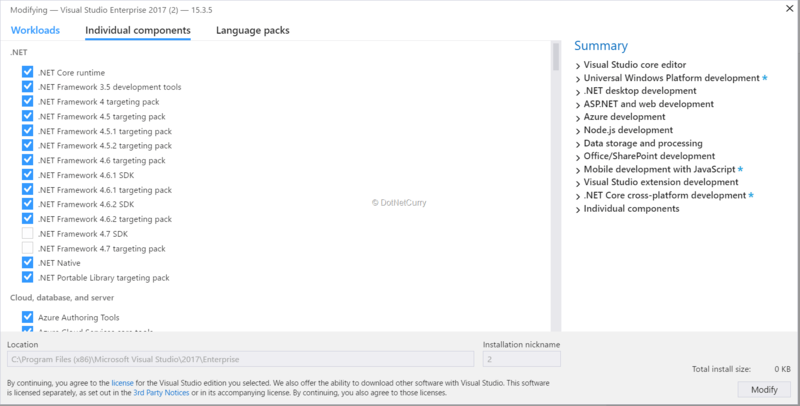 The Language packs allows you to choose the language for Visual Studio. The start page shows options like Recent and Open, which are similar to the previous version of Visual Studio e.g. 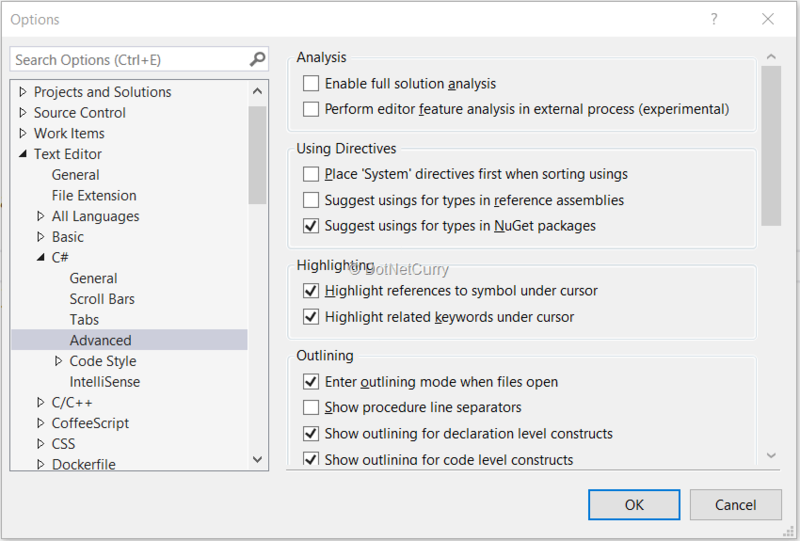 VS 2015, but a new feature worth observing is to create a New project using the Search project templates search box or the Create new project link. Once the project category (e.g. Web Ap) is entered in the textbox, all matching project templates are searched and displayed. Once the project template is searched and the name of the template is clicked, the New Project window will be opened. The same New Project window will also open on clicking the Create new project link. 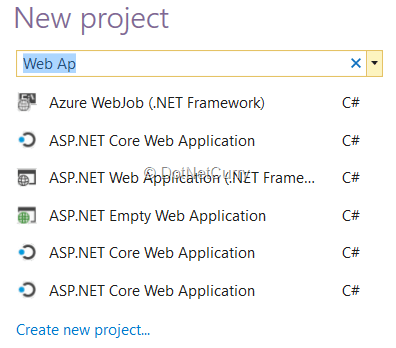 Note: If this is not a fresh installation and you have already created projects using VS 2017, then before you start searching for project templates, the recently used project templates are listed. Once we create a solution, it will be added in the Recent solution list. The Enable option decrease time for loading the solution. This option also results in some limitations e.g. projects will still be loaded as needed when first accessed (directly or indirectly) and in this case, features like edit and continue won’t work. 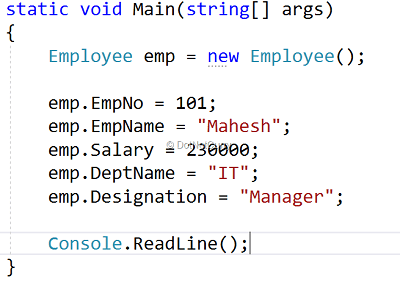 Open Program.cs and create an instance of the Employee class. 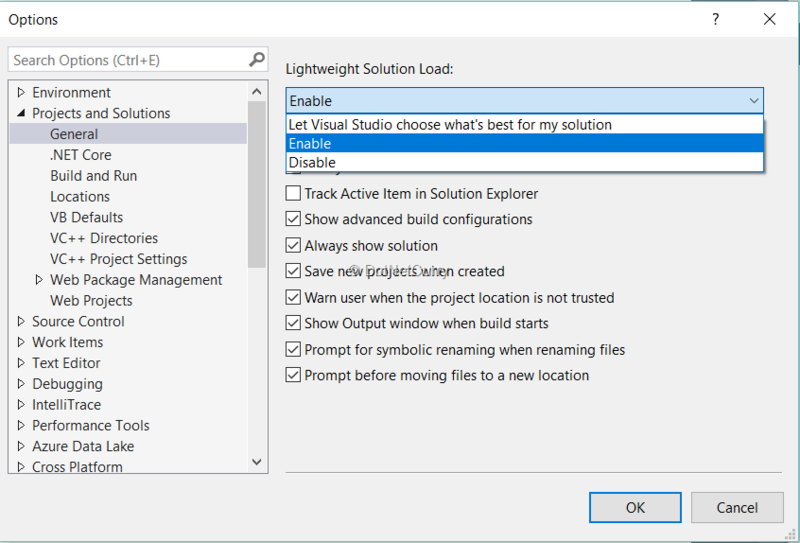 VS 2017 has enhanced navigation experiences for developers to move from one point to another. For e.g. a developer can easily navigate all Employee declarations that matches with the word entered in the search box, which can be opened using a short-cut key Ctrl+T. Here a developer can select where to navigate to e.g. to an Employee class, Employee.cs file or other Emp references e.g. members. All this facilitates an easier code navigation, with less distractions. One of the important features of this dialog is the icon-menu-bar on the top. 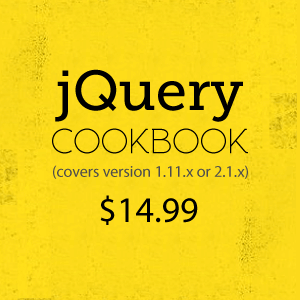 This icon-menu-bar provides options for selection of code navigation e.g. File, Class, member, etc. The following image explains it in details. While writing code, developers creates several code files and refer to various types at various places for defining instances e.g. Employee references in various files. In Visual Studio 2017, these references can be easily searched using an improved reference window. In the three code files we just saw, an Employee object is used for instance creation and property declaration. This window will list all Employee references in all the file names. For e.g. in the above image, a reference of an Employee in Payroll.cs is displayed in the tooltip. The references window also provides a facility to search from the references using the search textbox on the top-right corner of the window, as shown in the following image. The search can be based on the File name, Column number as well as the Line number. This shows all Employee references from Program.cs file. The above image shows references for Manager and Employee. As a developer, when some code is added in the application, sometime it happens that the developer knows the class to be used in the code, but the name of the package from which this class is used, is not known. In this case, a developer sometimes searches online for help but such help is not always helpful (pun intended). For e.g. a developer who wants to use the DbContext class or a JObject class but does not know which NuGet package needs to be installed for the project. The checkbox for Suggest usings for types in NuGet packages is not checked by default, please check it and restart VS 2017. Once the Install package ‘EntityFramework’ option is selected, the package will be installed and its status will be shown in the VS 2017. I hope you too realize what a cool feature this is! When the code file contains several classes and a class contains several lines of code with several programming constructs (if...else statements, for loops, etc. ), while scrolling down in the VS editor, it is at times difficult to track the scope of the current statement. This is another cool feature of VS 2017. This feature provides suggestion for defining variable name in a class/function as well as input parameters to the function. This helps to follow naming standard for variables/parameters in the application. In the Payroll class, try to declare a Manager object. 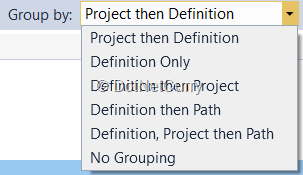 VS 2017 will show the suggested name for the declaration of object, as well as for methods too. This helps to keep coding standards in check. For e.g. in the above image for ‘var’ preferences, the For built-in types is set to value for Preference as Prefer explicit type and Severity as Suggestion. In this case, if the code variable contains declaration as shown here.. Here an explicit type can be selected instead of a var declaration. Likewise, there are several suggestions provided in the options windows which can be helpful to provide a better coding experience. I would encourage you to explore them all. To change the above code using the Auto-Initialized syntax of C# 3.0, VS 2017 provides a new feature. How convenient! We could change the object declaration/initialization in a jiffy! When a method accepts a reference type (e.g. 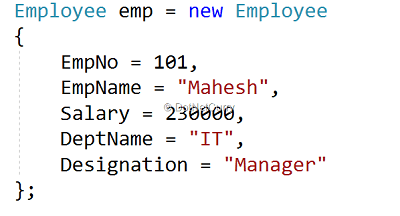 Employee object) as an input parameter, then while accessing that method, it is important to check for a non-nullable value for the input parameter, before passing it to the method. Alternatively, the method must have code for checking for a null value. In VS 2017, this feature is provided so that a method can be added with the required null check. Likewise, if the method accepts a string parameter, the code can be refactored to generate conditions for string.IsNullOrEmpty and string.IsNullOrWhiteSpace check in the method. This useful feature helps developers to reduce logical errors in the code. When a method having various input parameters in a specific order needs to changed either by removing some parameters or changing order of parameters, then it will definitely result in to a compilation error. If the method is called at various places in code, the Developer would need to manually keep track of changes in the method and update the code accordingly. This is a time-consuming task! 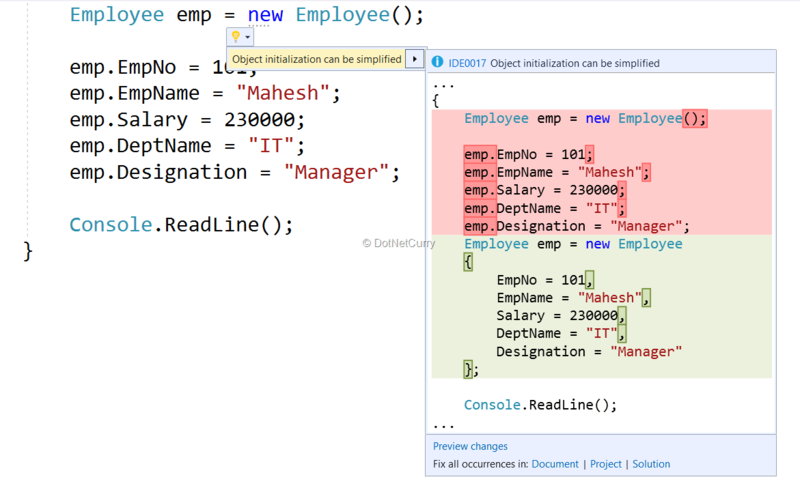 In VS 2017, the signature of the method can be easily changed and these changes can be reflected at all places where this method is called. This saves the developer some precious time and makes the code error-free. Consider the following PrintName() method in the program class of the Program.cs file. The PrintName() method accept two string parameters fname and lname. 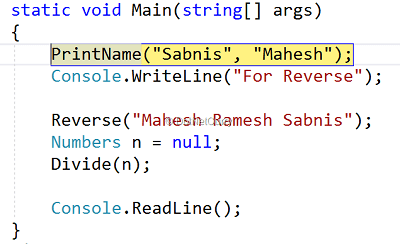 This method is called in the Main() method with the values set for fname and lname as Mahesh and Sabnis respectively. If we need to change an order of fname and lname in the PrintName() method, then in the Main() method, values for these parameters needs to be changed manually. In VS 2017, this can be done easily by refactoring the method. Right-click on the method name and select Quick action and Refactorings option from the context menu. Clicking on the Change signature option will show a Change signature window. Using this window, the order of parameters in a method can be changed or they can be removed altogether. In the image you just saw, click on the button with the downward arrow and move the fname parameter below the lname parameter. Now click on the Ok button, and you will see that the method signature and its call will be updated. 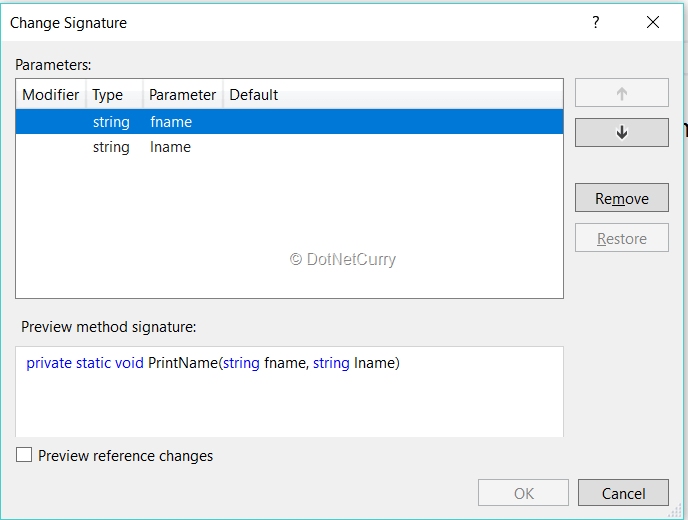 Once the PrintName() method signature is updated, the PrintName() method call with its parameter values is also updated. The advantage of this feature is that it reduces potential errors which a developer can make while updating the method definition in the application. Once the code has been written, it is important for a developer to debug the code to ensure that the code is logically working and has been diagnosed for exceptions, if any. 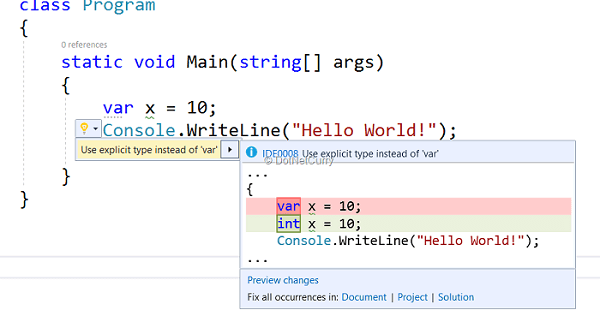 In VS 2017, there are some improvements made for debugging and exceptions management. 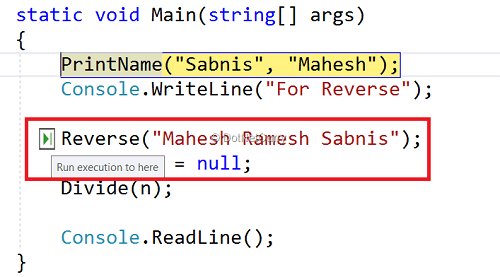 In previous versions of Visual Studio, when breakpoints were applied on various lines, it was necessary for developers to press F5 to skip lines in between two breakpoints, to continue debugging from next breakpoint. Or, for the developer to skip the current breakpoint and continue debugging ahead, it was necessary to put additional breakpoints. In this case, it was necessary for the developer to keep track of all breakpoints (imagine a for/foreach loop occuring in between the code). To get rid of this, in VS 2017, a new feature known as Run to Click is added (similar to Run to cursor feature of the previous version), which allows the developer to skip the lines in between breakpoints and start executing code from the desired line. Consider the following image. A breakpoint is applied on the PrintName() method, so the debugger will stop at this method. This means that an execution is continued from the Reverse() method call, hence there is no need to apply a breakpoint at the Reverse() method call. Dealing with exception is a common developer problem irrespective of the technology. In this case, it was challenging for the developer to find out the exact exception and it was necessary to see the View Details and Inner Exception to find out what is the reason behind the exception. 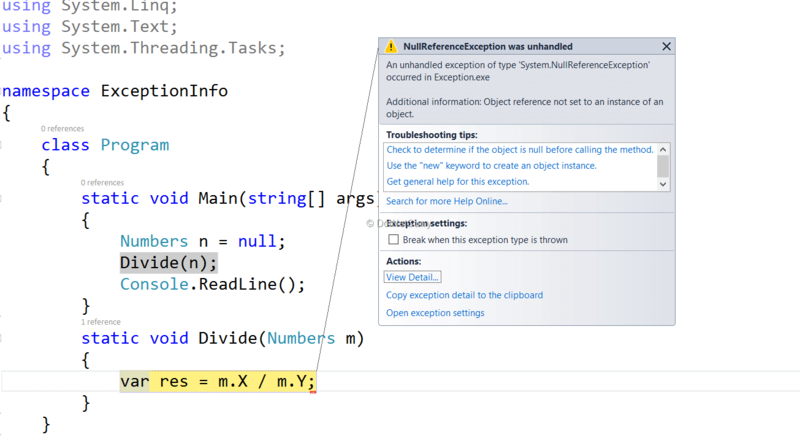 This helper shows an exception message and provides the reason behind the exception. In this case the Object reference is not set to an instance of an object exception is fired and the cause of the exception is also displayed as m as null. This helps developers to understand what is the reason behind an exception and how to handle it. The main advantage here is that, earlier it was required for the developer to see the Inner Exception in the View details dialog; however in the VS 2017, the in-detail exception information is seamlessly provided to the developer. Apart from all the above features discussed, there is one more important enterprise feature provided in VS 2017, and that is Live Unit Testing. This feature encourages Test Driven Development (TDD) and helps in developing better quality code and code coverage. 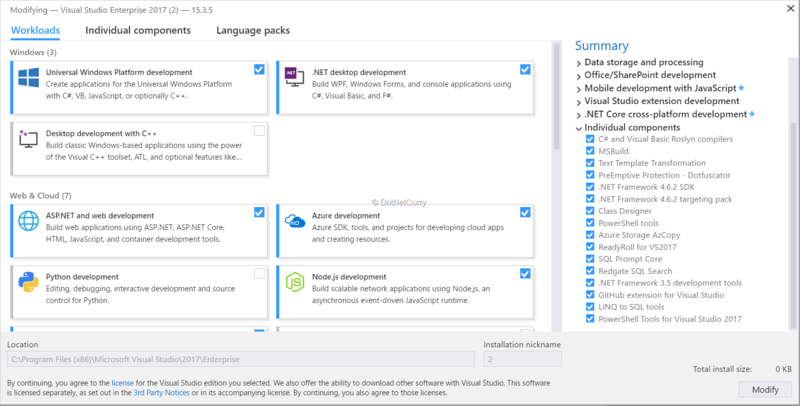 You can read more about Live Unit Testing at https://www.dotnetcurry.com/visualstudio/1363/live-unit-testing-visual-studio-2017. Visual Studio 2017 is packed with improvements and new features that increase productivity. This all-new IDE released by Microsoft helps developers to build stunning apps on Windows and other platforms. I hope this article served its purpose and introduced you to these productivity features which will help you simplify your most common tasks, and ultimately boost your productivity. This article was technically reviewed by Damir Arh and Suprotim Agarwal.